The real-time Ethernet for industrial automation. Safe, simple, flexible... and that in hard real time. 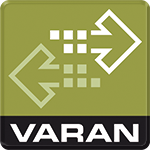 VARAN is the real-time Ethernet for industrial automation. Following the Industry 4.0 approach, the high-performance network connects systems, machines and components from the management level to the smallest sensor; in hard real time. With its adaptable topology and guaranteed data security, the VARAN bus is utilized wherever the highest demands are made on flexibility and availability. Unconfirmed messages are repeated within the same bus cycle. Bus properties, such as the cycle time and isochronous start time, can be adapted for any requirement. Whereby, the real-time Ethernet is designed for small systems as well as for complex multi-manager structures. Instead of standard Ethernet frames, smaller data packets are used with the VARAN bus, guaranteeing the highest possible resistance to disruption. The VARAN Bus User Organization “VARAN-BUS-NUTZERORGANISATION” (VNO) was founded in July 2006. The independent organization supports members in the implementation of VARAN and is involved with continuing research, development and application of new technologies. In doing so, the organization is cooperating intensively with other leading standardization groups.